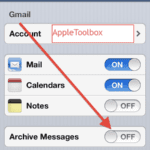 Tap Settings > Mail, Contacts, Calendar and delete your email account. Then tap Settings > Safari > and Tap Clear History and Clear Cookies and Data. 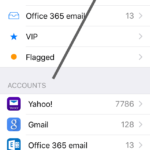 Now tap Settings > Mail, Contacts, Calendar and re-enter your email account credentials. 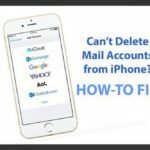 Notes: The instructions above will not delete your email account itself (e.g. 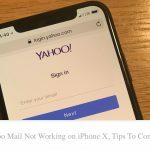 Yahoo, Gmail etc), just remove it from the iPad,iPhone or iPod mail app. Finally GOT MAIL did what instructions stated and powered off then on. however anyway to retrieve the ‘notes’ I hadn’t saved beforehand like an ignoramus? anyone?? If you do this fix don’t you lose all the contacts, notes & calendar? Didn’t work. Happened after recent update. Worked like a charm! Thanks so much. 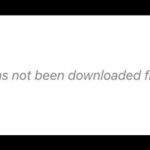 I’ve been trying for days to get my email back on my iPhone. I had the same problem…. but all I did was power down, wait a minute, and power up. That did the job. Didn’t work. Now server unavailable. Any more ideas out there? Great. Worked first time. Thanks. Didn’t work for me. It’s now saying server in available. I will hunt some more but if anyone cooks help I’d appreciate it. 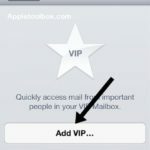 When you’ve finish the steps above, try to access your mails if it ask you for your password, just press cancel until it goes away. Excellent. Fixed the problem. Thank you very much. Mail error: MFMessageErrorDomain error 1032. Mail error: MFMessageErrorDomain error 1032. 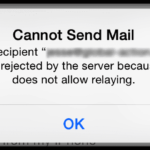 The fix for this only works if you switch ipod touch off completely before you re-install e-mail account. Apart from that, it seems to have worked. I’m unable to make this fix work. When I try to reset the account I can’t enter my information because the Next button doesn’t work. I tried turning off my iPod Touch completely before trying to reset the account. The Next button still doesn’t work. I did the above steps, keeping in mind your additional step, and it worked to perfection. BTW, the model I tried it on, is a 4S.